Okay... I'm back. And, I have a fun project to share. One of my online art groups recently had an "altered wand" swap. We needed to make just one wand with a theme of our choice. And, it had to have lots of hanging fibers and trinkets. When I set out to design mine, I knew I wanted to make a "bird" or "nature" themed wand. When I found the cute little wire birdcage, I knew exactly what my wand was going to be!!! It came complete with a birdie, nest and eggs. All of the fibers and trinkets hanging from the wand. What fun to collect and assemble. I wrapped the handle of the wand with a variety of wire and beads. I even made a bird egg for the base of my wand. Hope you enjoy... spring is in the air. 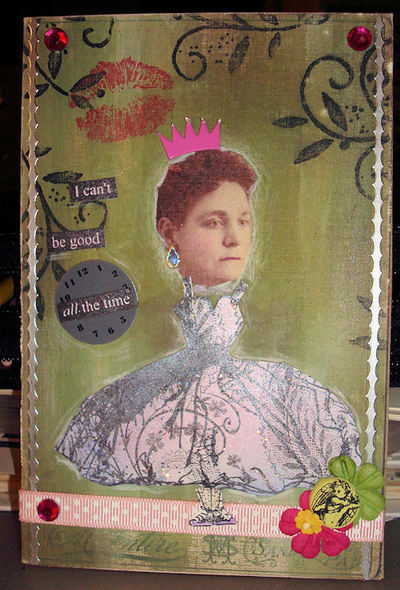 I just finished up a Altered Cabinet Card swap with one of my online art groups. We each had to alter 6 cabinet cards and include some type of container to hold them. We'll each receive 6 random cabinet cards and a container of some sort, in return. 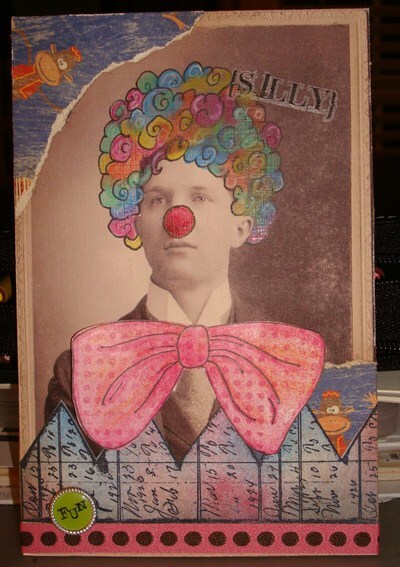 I have to admit that I was somewhat intimidated about altering my cabinet cards... until I started working on them. Oh what fun these were to do!!! I wanted to just keep going on and on. I had absolutely no idea what I was going to do before I sat down at my work table. After working on the first one, there was no slowing me down. This is my "container". 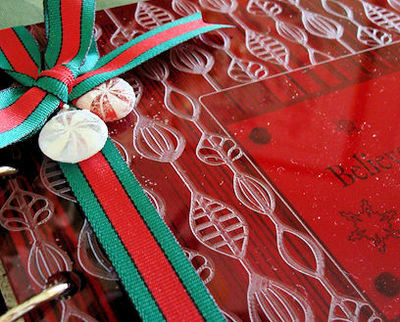 It is just a metal tin (pencil box type) that I added layers of ribbon to the outside, and altered the lid as you can see. 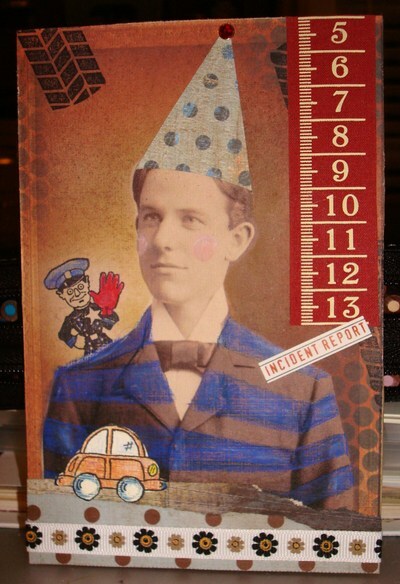 Incident Report - This is probably my favorite card. He was masked and the background was stippled with chalk inks. Colored his prison stripes with colored pencils. 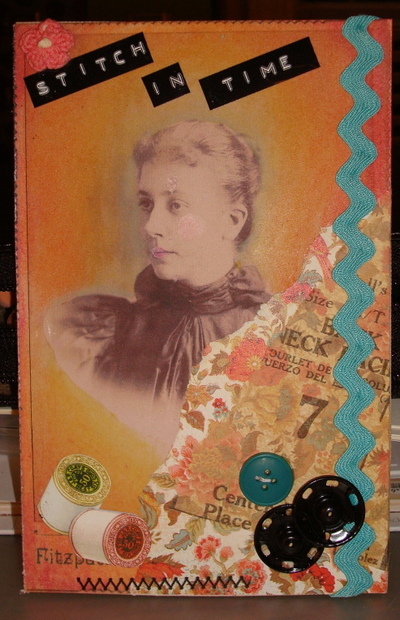 Various other stamps and embellishments. 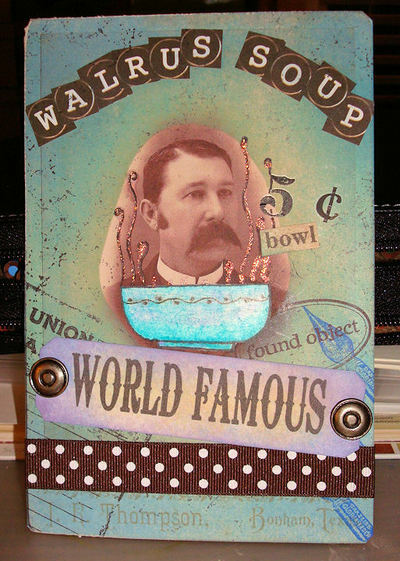 Famous Walrous Soup - How can you not think of a "walrous". The background was also stippled with chalk inks. 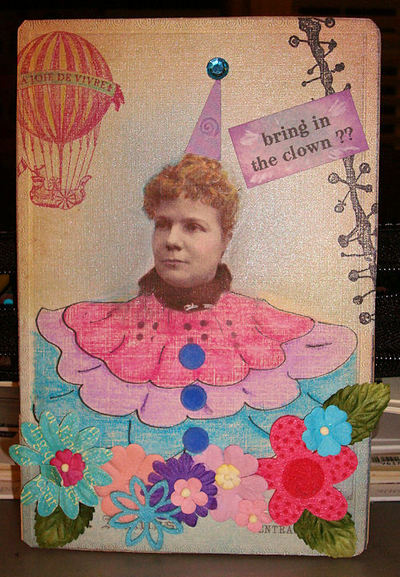 Bring in the Clown - This lady inspired me with her clown-like dress she had on. I just drew the giant ruffles and colored with colored pencils. She was masked and background stippled with Brilliance inks. I colored her hair with pencils. Lots of highlighting with pencils also. Monkey Business - This guy is simply goofy. I drew his hair with a pen and colored pencils. 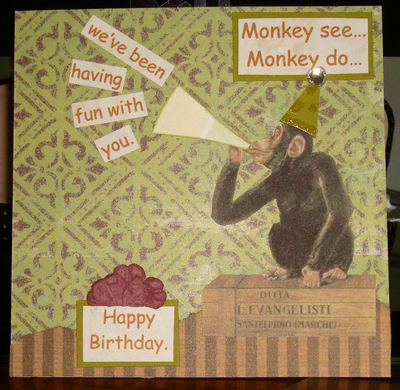 Added stamped images, drawn bowtie, and monkeys. Gotta love his big red nose. A Stitch in Time - I thought she looked like a seamstress. Not to much else going on in her life? She was masked and I used oil pastels for the background. Various embellishments added. Princess in Tennis Shoes - I masked this lady off and painted the background with acrylic paints. Did some over stamping. 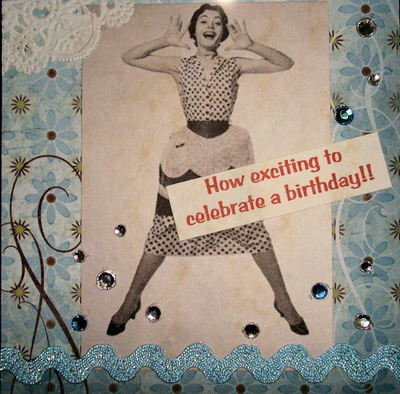 I stamped and cut out her dress and tennis shoes, and attached them to the card (Brilliance ink). She was highlighted with a white colored pencil. Various embellishments added. Give these a try! You'll have a fun time doing it. Even if you only have copies of cabinet cards, they will work fine. Just attach them to poster board or mat board. As I recently posted, in late July I attended an art retreat with a group of fellow online artists. 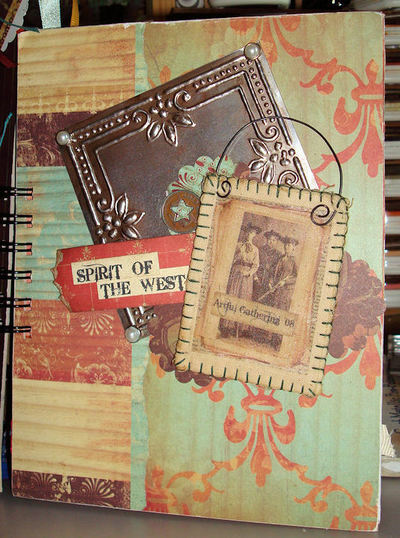 I finally have pictures of my finished "Spirit of the West" book to share. To some, this may look like an odd looking hodge podge of paper and embellishments. But... to me it is many days of creating, having fun, and making memories with good friends. 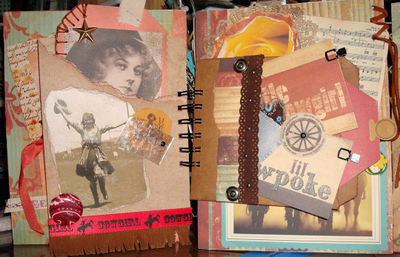 During our long weekend, we each made a spiral bound western themed book. 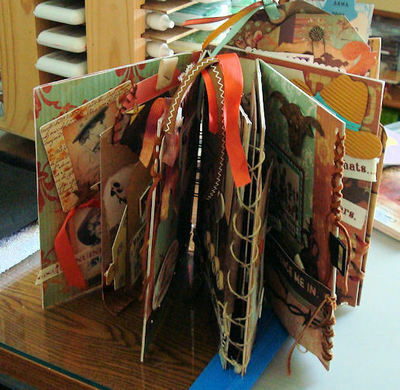 The pages were made from mat board and the book was to be bound with the Bind-It-All. We had a sample to follow and/or use for inspiration. I chose to bind only 3-4 of my pages, and lace together several of my pages side by side, creating a long accordian pull out page. This is the simple cover I ended up making. The mat board was covered with Cosmo Cricket papers. 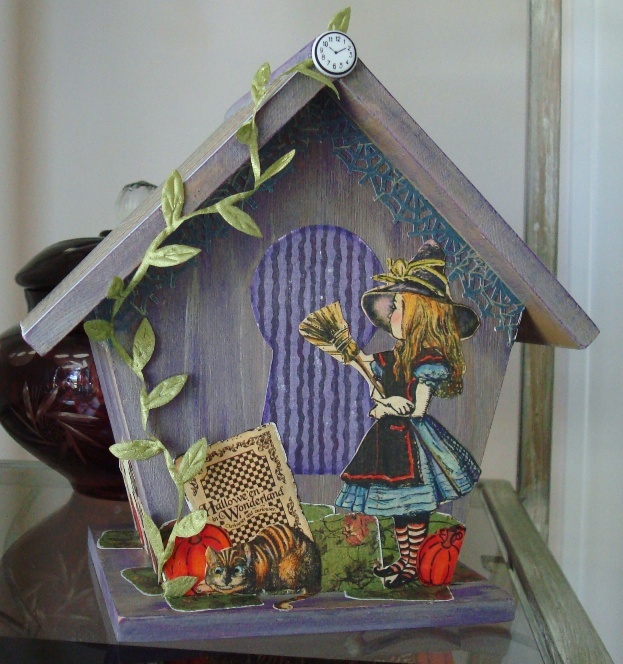 I added pressed tin tileaged I aged with StazOn ink. The hand sewn, fabric transfer piece was a gift from one of our members. She made each of us one, and I thought it was so lovely that I had to showcase it on my cover. 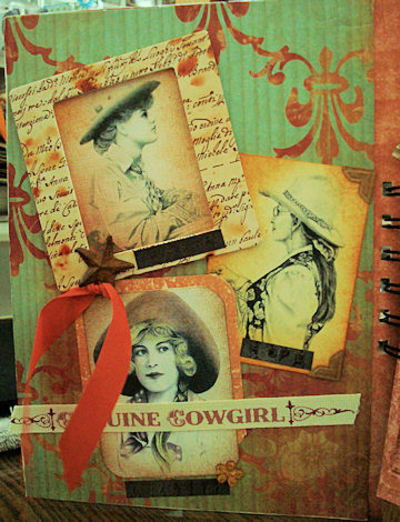 The first page was a page dedicated to my cowgirls Faith, Hope and Charity. After the first page are two pocket pages. The first having a stitched tag inside of it, a hand covered bandana button and various images. 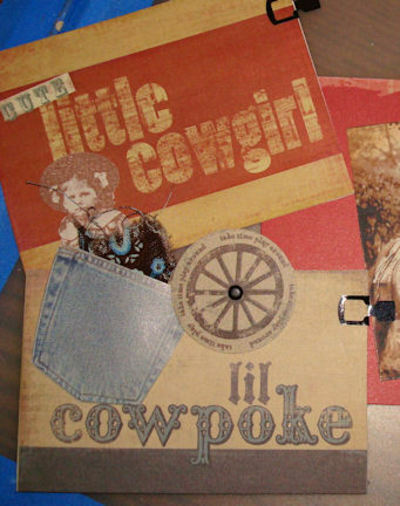 The second pocket page is a folded paper bag page that is all about "kid" cowboys and cowgirls. The front has three tags tucked away. They include stamped images and even a denim pocket with a bandana hanging out of it. The backside of the paper bag page has the cutest image of youngsters, and a cute wanted poster. I even include a packing tape transferred star image. 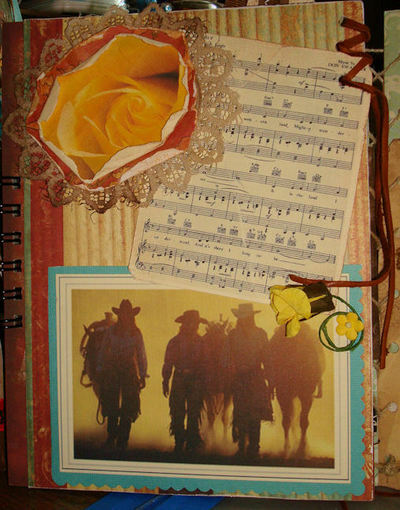 The next page is my "yellow rose of Texas" page. The flower is dimensional. It is several layers of cardstock with the edges rolled up, with the top layer being a photo of a yellow rose. Some tea dyed lace is around the flower. -- to keep this post from getting too long, I will post the continuation of my westerm book within the next day or so. One of my online art groups has a monthly art lottery. 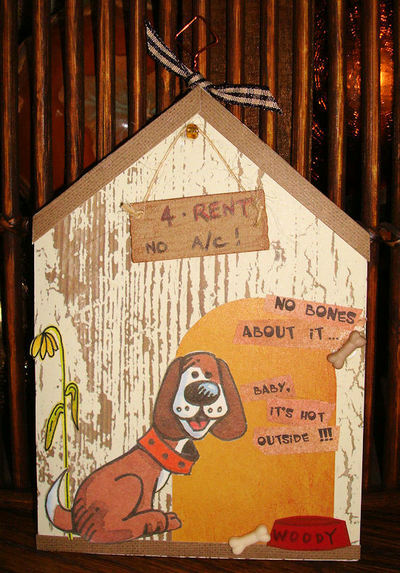 This months theme is "dog days of summer". We can make whatever we want, as long as it is in the theme. I took this theme quite literally and came up with this foam core dog "row" house. It is truly silly and cute. 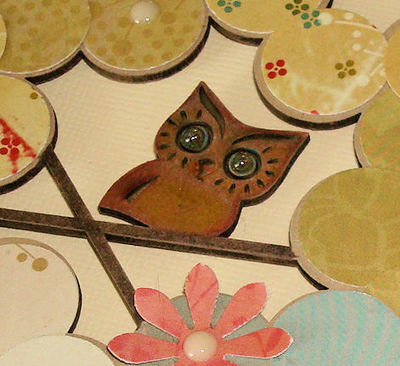 I had some Paula Best stamps that I purchased at least a year ago and had not yet used. Today, I decided I'd get the sets out and play with them. I made this "bird lady" using a body stamp and a floral head stamp. 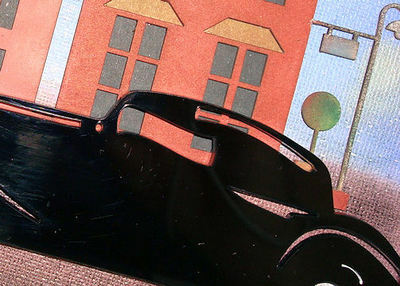 The stamped images were colored using Prismacolor pencils and Sansodor (for blending). The body is mounted on a piece of foam core. I brought the head forward a bit more with a piece of chipboard. The arms are a ribbon loop with a glass bead. The legs are a scrap of beaded button trim. 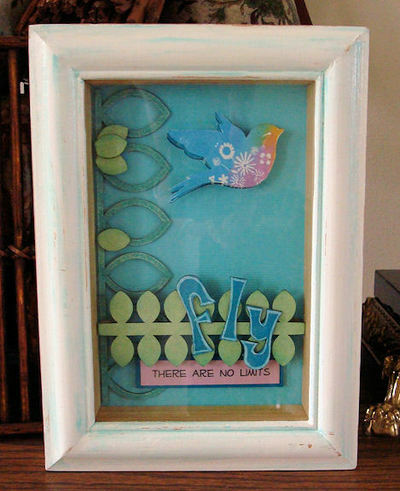 I added a looped wired at the top to hang my "dangly" bird lady. I am home from my annual trip to the Artful Gathering. 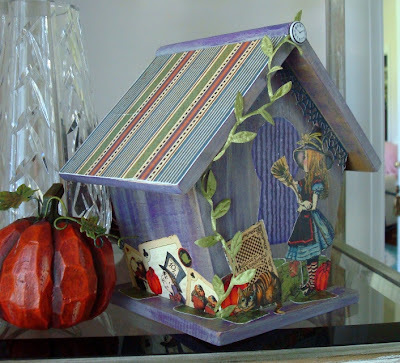 This is an art retreat that is organized for one of the online art groups that I am active in. 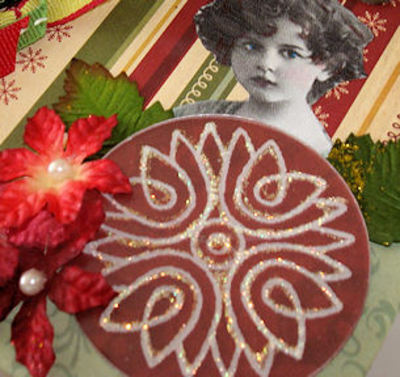 It is four great days of primarily doing altered art (and attending a stamp convention). We do lots of art, eat, laugh, get to know each other better ... just have a wonderful time. I think we had 21 attendees this year. They came from all over the country. I am so lucky to be a part of this group and to do art with such talented women. 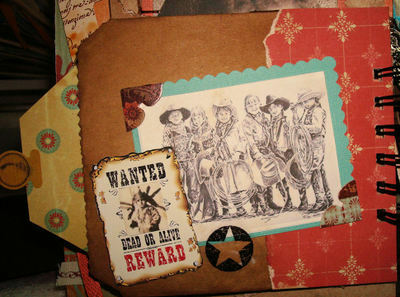 The theme for this years Artful Gathering was "Spirit of the West". 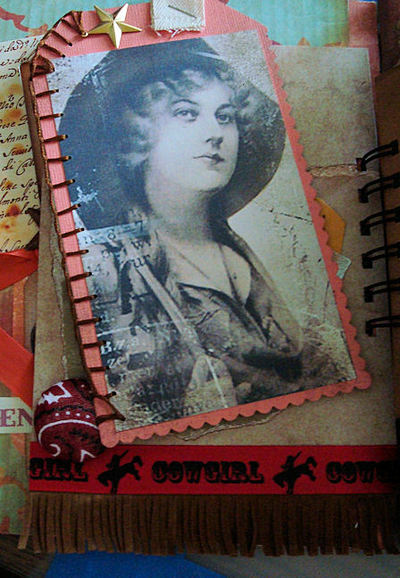 Our main project was a bound western/cowgirl book. I will be posting photos of my finished book in the next couple of days, along with photos of other projects. I also recieved my round robin altered book. I have art by three other artists in my book. I will be getting that photographed and posted soon also. I am also thrilled that I have my sister-in-law and nephew visiting us for a few weeks. I couldn't ask for anything better!!! What a treat for us. My nephew is growing up so quickly, but is really a nice young man. I'm very proud of him. He has been having fun swimming, playing with the dog, playing Guitar Hero, and watching movies. He's played basketball at the gym with his uncle, and also gone golfing with him. I think he favorite part is driving the golf cart. I'll be back soon with photos of all that I have been working on. 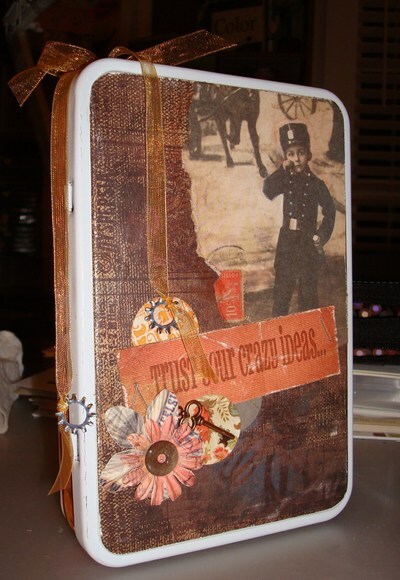 I just finished up working on some altered book pages. These are for a fellow artisans altered book entititled "Are You Game?". My first layout is all about Child's Play. I tried to include some of the simple games and activities we did as kids. 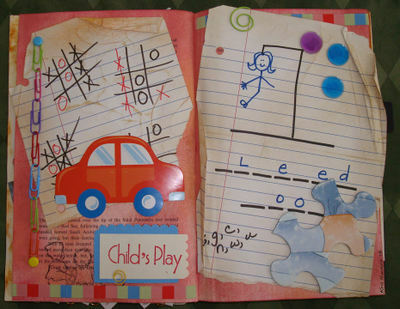 From tic tac toe to hangman, from puzzles to card games. Even a chain made from paper clips. Remember those? If I had had gum wrappers... there would of been a chain made from those too. In this layout, I just wanted to show some different card and "table" games. I cut a niche into the book on the right page, and inserted real dominoe tiles. Below that are two niches... one for a bingo card/marker, and one for some miniature wooden dice. 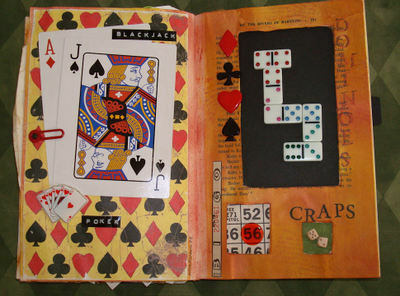 The left page uses two HUGE, oversized playing cards. This is my Monopoly layout. I lightly painted the pages with a silver glaze. The pages on the right were folded to size, with every other page being inked in black. If you hadn't figured it out, it is suppose to look like the bars of a jail cell. 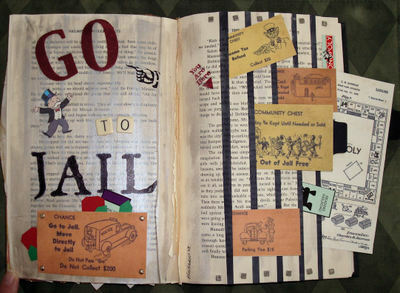 I used chipboard, alpha tiles, and stamps (Purple Onion Designs) to spell out "Go To Jail". I added copies of vintage Community Chest and Chance cards between the cell bars. I inclued an image of the original Monopoly game diagram from 1935. All of these pages were fun to do. I hope you enjoy them Carole. 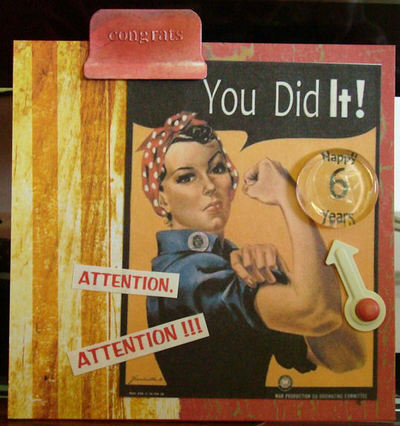 One of my online art groups recently celebrated its 6th birthday. Members of our group sent our wonderful leader birthday 4x4's that she could make a fat book from. Here are some of the pages I sent.